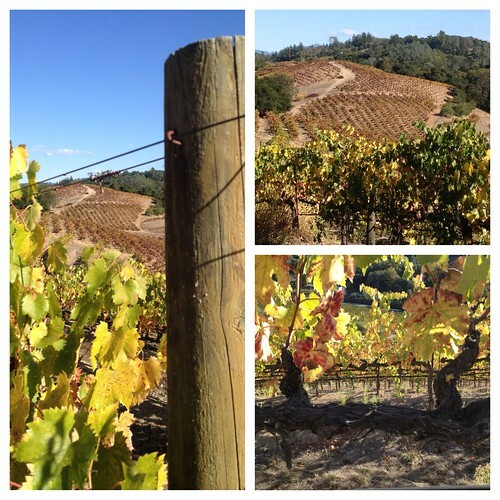 I just returned from visiting wineries and vineyards in Dry Creek Valley, California. 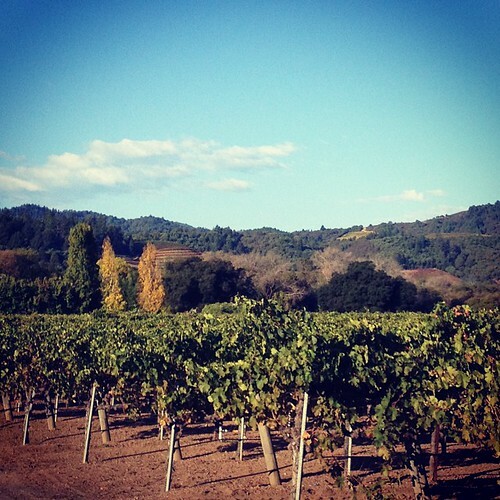 It’s a region within Sonoma County that will surprise you like it did me. Here are a few things I found remarkable about the region during a trip sponsored by the Winegrowers of Dry Creek Valley. 1) Dry Creek? Not dry. Visual proof to your left. The construction of a dam has obscured its original name and state. 3) There is wide range of styles of Zinfandel, Dry Creek Valley’s signature red grape, and Sauvignon Blanc, the region’s white grape counterpart. Zin-wise, you’ll find the elegant, low alcohol wines of Nalle Winery to more peppery versions to full-throttle bruisers. And Quivira Vineyard and Winery makes a Sauvignon Blanc (Fig Tree Vineyard) that spends time in Acacia wood barrels. The Zin is strong with these ones. 4) Zinfandel is age-worthy. 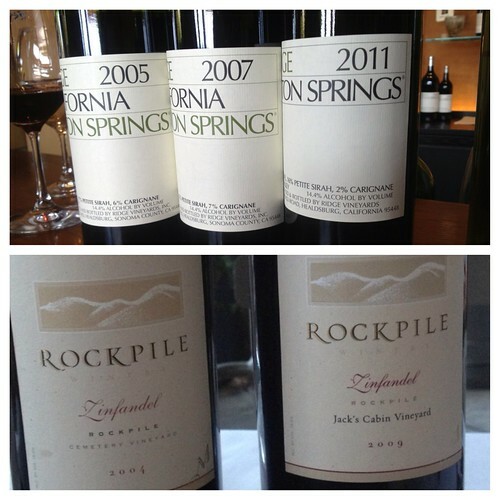 Probably not for decades, but a lineup of Ridge Vineyards Lytton Springs including a 2005 and 2007 as well as a 2004 and 2009 Rockpile Zinfandel from Mauritson Wines shows that when the right sites and winemaking align, your patience will be rewarded. 5) “Zinfandel needs friends.” No, not human friends. Zin has plenty of those. But rather grape friends, in the guise of a small percentage of others to pal around with in the bottle. The quote comes from Dutcher Crossing Winemaker Kerry Damskey, who noted that Carignan adds acidity and brightness, Mourvedre additional texture, and Petite Sirah some color to what ends up in your glass of Zin. This sentiment was echoed by conversations I had with winemakers at Ridge Vineyards and Nalle. 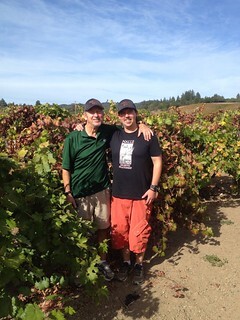 Father and son amidst the Zinfandel. The history of families and vineyards in Dry Creek Valley, like those behind Mauritson and Pedroncelli Winery, runs deep. The Mauritson’s have been growing grapes since the 19th Century. And at Pedroncelli, the fourth generation is now working at the winery. 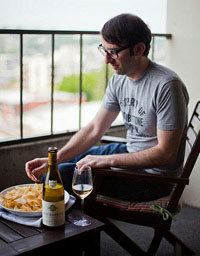 There’s also a family atmosphere characterizing the relationships between wineries. As Julie Pedroncelli told me, a “spirit of working together” unites the region. Even a more recent arrival to the area, Debra Mathey, owner of Dutcher Crossing, spoke of the intimacy of Dry Creek Valley. 7) Organic and Biodynamic agriculture are present. 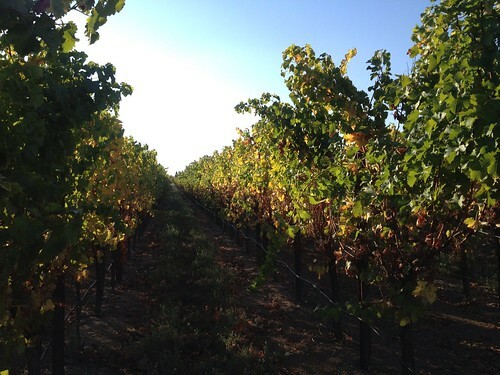 Check out what Quivira and Preston Vineyards are doing. The former is certified biodynamic and the later engages in many of the practices that are the hallmark of biodynamics. 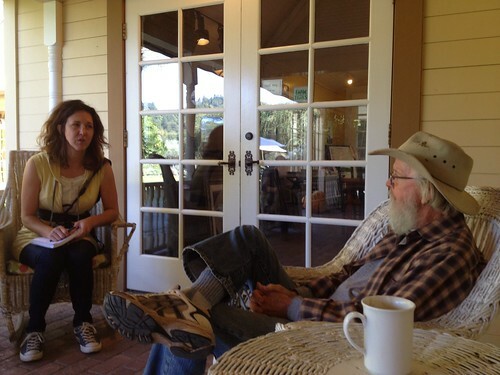 Elaine of Hawk Wakawaka Wine Reviews and Lou Preston. Chillin’ on the porch. Please peruse Elaine’s extended thoughts on Preston. 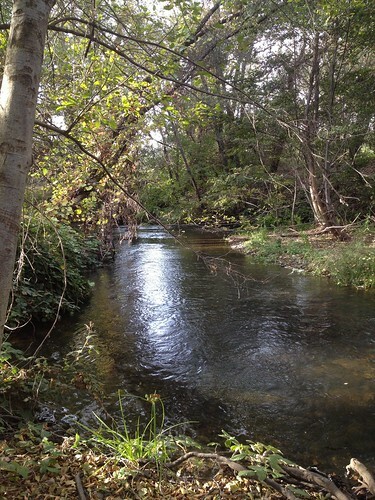 9) Dry Creek Valley is totally scenic. Here’s a view from the Comstock Family Vineyard, where I stayed. Next year they’ll not just be grape growers but have their own wine when their first release (a Zinfandel) debuts. Look out for a winery from them as well. And the scenery is not just in the flats. There are lots of dramatic hills and hillside vineyards, like at Pedroncelli. As I drove towards San Francisco to catch a flight back to Seattle, I thought about how easy it was to slip into the rhythm of Dry Creek Valley, appreciating the variety of wines, scenery, and people. You absorb the uniqueness and warmth that is both calming as the sun goes down and inspiring as you watch it rise over the vineyards in their morning glow. Regarding #4, Lytton Springs zinfandels age brilliantly for at least a couple of decades. I’ve been lucky enough to taste a handful ranging from 10-25 years old. All were excellent (good luck me). Your luck is truly excellent. I also got to taste a 97 Monte Bello while at Lytton Springs and though not a Dry Creek Valley wine, Ridge has quite the track record for age-worthy wines regardless of the grapes and/or location. Thanks for your comment. Definitely planning on Santa Rosa next time and you bet I’ll be bringing a case on Alaska!